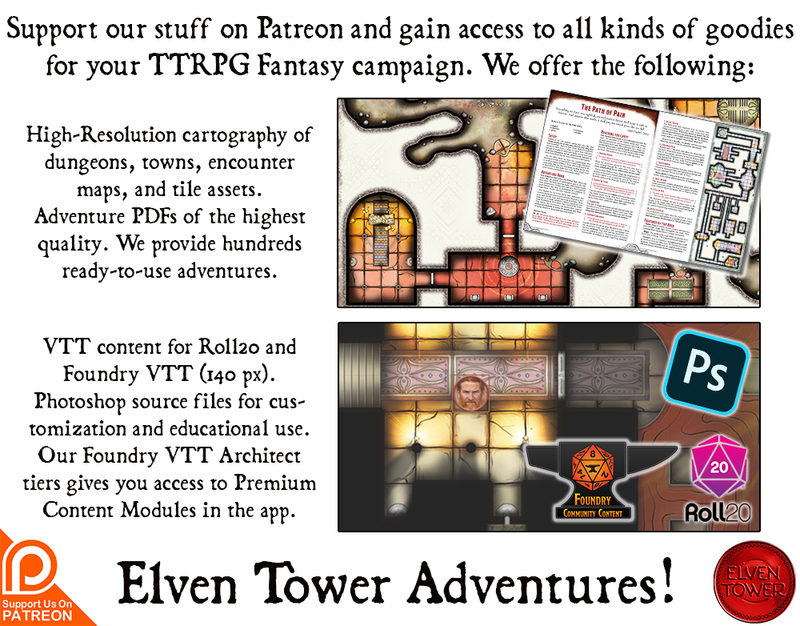 This short adventure is appropriate for mid-level (levels 5-7) adventuring parties. Challenge rating is calculated using a party of four as the model. There is a world unlike any other. It is hidden in plain sight just behind everything that there is. It coexists with out world, a reflection of it imprinted in the canvas of the multiverse’s cosmos. It is fundamentally different from the material world; the elemental spirits that infuse the land and air with their energy call this place home. A hill or forest in the material plane has an equivalent there, except trees and plants grow bigger and animals take a fantastical forms there. This is the Feywild, the realm of fey spirits and fairies. The Feywild is the material of many myths and legends told from parents to young children since the past ages. People often believe that the fey realm is a fantastic and beautiful place, and while that is somewhat true, the Feywild is also a dangerous place. Not all fey spirits are good, few are evil in essence, but many are raw representations of nature’s power. Powerful Fey Lords that get their power from the wind, the sun and the storms; they are feared throughout the fey world for their power is immense. One of such beings is Dareu, the Queen of Forests. Legends describe her as awe-inspiring, possessing such beauty that weak beings go blind just by beholding her countenance. A popular legend tells the story of her mercy and gratitude, and how she gives back their sight to loyal pilgrims who traveled to her oak castle just to see her. Queen Dareu is often seen visiting the material plane in the form of a big white unicorn. She travels the lands healing wounded beasts and sometimes the lesser races with her healing powers. Queen Dareu crafted a powerful artifact eons before elves roamed the land. A mighty goblet that she infused with the life-force of a dying Archfey just like herself. This was the queen of bees and insects, Anaralla. She perished from her wounds in one of the Feywild wars, her spirit and might preserved in a new form, inside the magical goblet. Bees in the Feywild are luminescent like fireflies; both insects are not far apart in the fey world. Queen Dareu used the Goblet of Fireflies to exert her will to command bees, fireflies and insects in the coming wars. Absorbing Anaralla’s might through the goblet, Dareu became the most powerful Archfey during that period. Insects are weak and insignificant individually, but in great numbers, all working together in a coordinated effort, none could stop them. Queen Dareu predicted her own demise in the future, all fey spirits come from the land and shall return to it sooner or later, to be reborn later on. They are immortal but in a different way. She believed in her own constraint and control to avoid misuse of the powerful artifact, but after her end, any other Fey Lord would be free to claim the artifact and command the unstoppable power of fireflies and insects. She came to an answer to her predicament and decided to hide the artifact in the material world. She created an underground vault to protect it. She hid the Goblet of Fireflies in a chamber and sealed the doors with powerful incantations. She made the place invisible to magical detection. The doors can only be opened by singing a the Ballad of Light, traditional music of the ancient fey courts. The song is unknown to all in the material plane and even most in the Feywild. It is only remembered by immortal spirits. Queen Dareu left hints to the ballad’s lyrics in the vault. They are written in Sylvan, hidden in plain sight in the murals and walls. The place is protected with arcane traps and fey spirits loyal to the Queen of Forests. As a last protective measure, the entrance to the vault is hidden inside a great dead tree, it is only accessible during the summer solstice. Adventurers come across the great dead tree where the entrance is hidden in the exact day it appears. This is a big coincidence brought forth by destiny itself, or perhaps an immortal entity like a god influenced the party’s actions. If the party decides to explore the place they will find out about the background lore from the murals and other readable information inside the dungeon. As part of the loot from other quest, the party receives a sealed scroll which radiates a magical aura. On inspection, the scroll appears to be empty with no sign of use of scripture. This is an illusion spell hiding the text. Once revealed, the Sylvan scroll reveal the location of the vault and the moment when the door appears. The party will need someone to translate the scroll or access to magic with the same effect. This scroll does not reveal the full nature of the vault, but it mentions the Goblet of Fireflies by name and speaks of its great power. A pixie named Frabulunbiog introduces itself to the adventurers and begs for their help. Frabulunbiog explains that a powerful artifact from ancient times has been located and several Archfey are now claiming possession of it. Frabulunbiog serves one of such Archfey, a considerate and generous one. Before the fey courts come to a decision, Frabulunbiog traveled to the material plane with the assignment of taking possession of the goblet before the more deadly and dangerous Fey Lords did. Frabulunbiog knows about the location of the vault and requests assistance to explore the place. He means to keep the goblet for his Fey Lord but explains that the vault should be filled with other treasures which the adventurers are welcome to keep. It is up to the DM to determine whether Frabulunbiog is honest or he is actually one of such Fey Lords masquerading as an innocent pixie. The user can use the goblet’s influence to command small groups of crawling or flying insects to do small tasks such as the ones possible with a spell like Mage Hand. 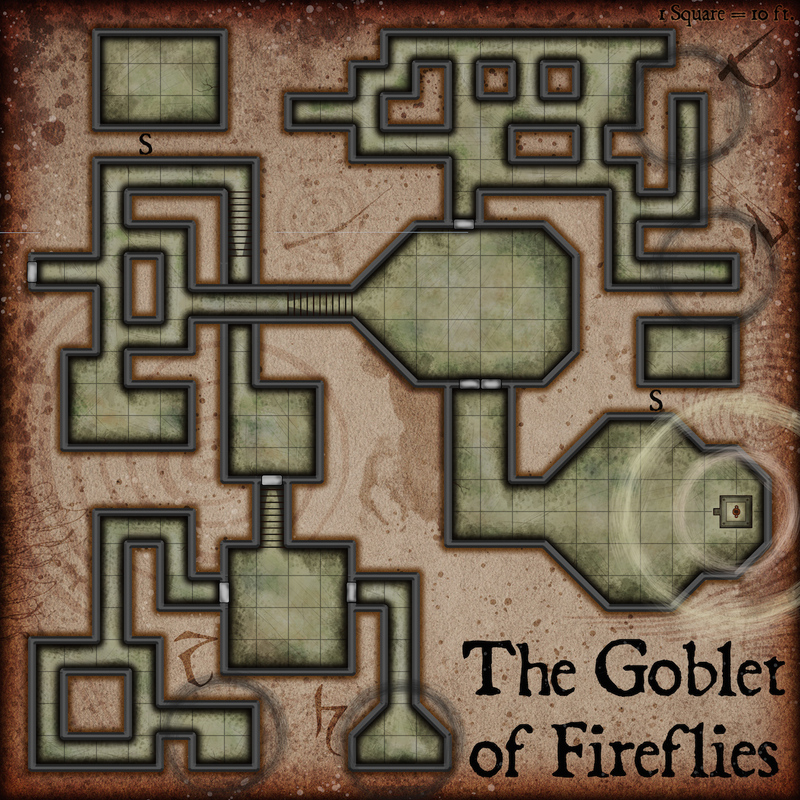 A Fey Lord can use the Goblet of Fireflies to its full potential and command all insects within a 10 km. radius to perform any kind of actions. The ability lasts for as long as such Fey Lord remains in control of the goblet. The potential acquisition of the goblet by a powerful Fey Lord and the wars it will cause is the source of a whole fantasy campaign. The characters might be assigned a mission to return the Goblet of Fireflies to a safe location, or a mission to destroy the artifact through a complicated ritual. It is not the intent of this resource to cover such material.